In December of 2010, I attended a Fiction Writing Panel at Marist, now my alma matter, where a few of the English Department’s writing professors–made up of published fiction writers, poets, and playwrights–discussed publication and the creative writing process. There was a huge turnout. At the time, I had no idea the writing community at Marist was so large–and it made me realize how “competitive” writing can be. The professors, though, asserted that competition makes better writers. Actually, they gave a lot advice that I took notes on, knowing I’d want to re-share it with myself one day, as well as with others. Contests. The panel said that literary contests are so useful to writers. They are a good way to get material out somewhere and a good way to acquire money if this material places. The Writer’s Chronicle houses a majority of information about contests and journals, especially undergraduate journals. 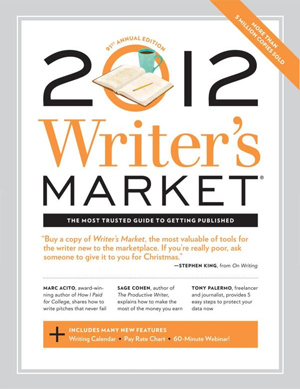 The annually published Writer’s Market book is useful to find contests and venues too (I had originally heard about this revered and large book when I read Stephen King’s On Writing). Other helpful sources include Writer’s Digest, CLLP Journal, Poets and Writers, and the Dramatists Sourcebook. Readiness. How do we know when a piece is ready? They said that once we finish something, we should get feedback from others, ideally from part-taking in a writer’s group. By being around other writers, a writing group provides instant inspiration and more importantly, deadlines. We want trustworthy readers too, for working pieces/manuscripts. Agents. It used to be that writers sent their work straight to the publishing houses and had relationships with their editors. Now, most people need literary agents in order to be published. If we send something out to get published in the mainstream, agents are helpful because they are looking for text that is marketable. It sounds like selling-out, and maybe it is, but I don’t see it that way. A piece of literature does not have to lose its literary merit just to be marketable and the right agent would aid in finding ways to get it published. Persistence. The professors seemed to agree that good stuff should eventually get published. But persistence is really what gets you published. Talent alone doesn’t always make it. So, we must figure out a way to love the process of writing. Everyone likes “having written,” but in order to “have written,” we have to keep at it. They said to make hard deadlines for writing. Finish. In the same vein, it is important to finish a piece, even if it’s not loveable anymore. Force through the uncertainty and discouragement, write without faith at times, and trust yourself as a reviser. Know Yourself. Writers should question why they are writing, and learn about their natural tendencies. For example, one professor said he has a friend who writes young adult fiction, and he said he knows enough about himself as a writer that he is not capable of writing in that genre. However, it is easy to waste time looking for an audience in the wrong place—a writer should broaden his or her sense of where an audience can be found while also being true to their own interests and abilities. Research. Dabbling outside of yourself and your own experience of life is important—this is where research comes in. It is important to be interested in research as a writer, especially to write truthfully about unfamiliar things. But first, get to know your home language and style—at first write what you know and then use research to know more. It creates an authenticity of writing. Read. I think this was my favorite piece of advice: Good writers are good readers. Writers must be reading constantly. This addresses some frustration I’ve had with dividing myself between reading and writing. But knowing that a writer should always be reading, we can at least not feel guilty about setting time aside for reading. Always remember that there are smaller, independent publishers out there. Be in the world; make writing a part of your life. Thank you for sharing this. Some I’d heard and some was new, and it all adds to the picture. Persistence I have. In fact, I don’t read much these days because it takes time away from writing. I should find better balance. I confess that a gravitate to fantasy because it requires less research. I’m glad I could provide you with some new advice, as well as reinforce what you have already heard. Reading does take time away from actually writing, but apparently reading is also a part of the work a writer must do. So don’t feel too guilty about reading. And keep up that persistence!